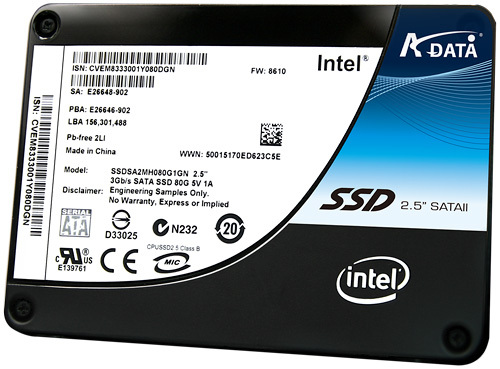 A-DATA Launches The World's Fastest SSD With Their X25-M Series | OhGizmo! This morning A-DATA announced their new X25-M series SSDs that are actually co-logo’d with Intel which from what I can tell means the drives have been tested on the latest Intel-based laptops and workstations, and actually feature Intel Multi-Level Cell NAND flash memory. According to A-DATA, the X25-M series are currently the world’s fastest SATA 2.5-inch SSD drives with read speeds up to 250MB/sec and write speeds up to 70MB/sec with only an 85 microsecond read latency. The new drives are available in 80 or 160GB capacities, though I couldn’t find any pricing information in their press release. Those are made by Intel and A-Data is adding a label and profit.